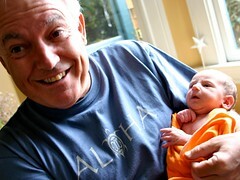 Grandparents now twice over, Peter and Barbara Lord visited Harper Sue this weekend in her San Francisco home. More pictures in this photo set. Again, you’ll need to be my Flickr Friend to see them. Make yourself a Flickr/Yahoo account and add me “roblord” as a friend then I’ll reciprocate.